The best ham recipe I have ever tried! Most ham recipes have a mustard sauce, and I don't like mustard. The perfect Christmas Ham! Dovetailing tip: Cube about 2 cups of the leftover ham (1/2" cubes). Save for Meal 5 Cauliflower and Ham Gratin. Drain pineapple, reserving juice. Place ham on a rack in a shallow roasting pan. 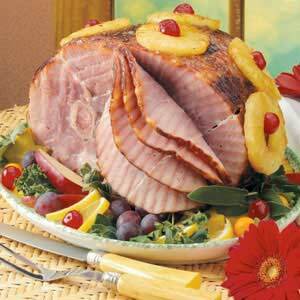 Secure pineapple and cherries to ham with toothpicks. Combine brown sugar and seasoned salt; rub over ham. Gently pour pineapple juice over ham. Bake, uncovered, at 325° for 1-1/2 to 2 hours or until a meat thermometer reads 140° and ham is heated through. Baste frequently with brown sugar mixture. Yield: about 18-20 servings.